I have been through phases when I could not bear to look at my credit-card balance. I knew I was spending more than I could justify, but even thinking about the numbers triggered stomach aches and self-flagellation. Money, and the issues around money, are notoriously anxiety-provoking, and my unhealthy coping mechanism was aggressive avoidance — a more slow-simmering form of agita that merely (and literally) compounded the problem. It’s a common refrain that money is the single greatest source of stress in the lives of Americans. This has been the case every year since the American Psychological Association launched its annual Stress in America survey in 2007. And with consumer debt reaching new highs, stress levels don’t seem likely to drop anytime soon. “Money doesn’t just represent safety and security and stability,” explains Dr. Matt Lundquist, director of Tribeca Therapy. “Money is safety and security and stability.” It is also unavoidable. Short of moving to an ashram or becoming an off-the-grid hermit (and even then, really) you can’t opt out. Which means your feelings about money are along for the ride, too — no matter how much psychic energy you expend trying to escape them. My unhealthy coping mechanism was aggressive avoidance — a more slow-simmering form of agita that merely (and literally) compounded the problem. So how can we deal with financial anxiety — particularly anxiety so severe that it drives you to irrational choices like ignoring bills entirely? To find out, I asked Dr. Lundquist, who practices psychotherapy, and Bari Tessler, financial therapist and author of The Art of Money. Both pointed out that, though financial stresses and their symptoms may feel unique, the strategies for dealing with them are widely applicable — meaning, conveniently, that you could use the same tools to manage different types of money anxiety as well as other stresses like work and road rage, for example. First step: figure out how you actually feel. Yes, you’re anxious, but what kind of anxious? When do you feel anxious? Where do you feel anxious? This is “feeling your feelings,” a concept so simple it can seem meaningless. For the emotionally confounded, Tessler recommends using a “body check-in” to examine the physical manifestations of your anxiety: “Are you seated? Are you legs crossed? Are your shoulders up high, or are they down?” Observe sensations like “tightness, stillness, fluttering” and the way you’re breathing, she says. Then move on to the emotional level. Tessler gives the example of sitting down at an auto dealership with her husband to negotiate the purchase of a new car. “I started noticing that I was feeling anxiety, like I was starting to hyperventilate,” she says. “But once I honored my emotions for a few minutes — named them, sat with them — I was able to move into the practical part of making a money decision.” Which, in this case, included another conversation with her husband before completing the deal. Once you become more aware of your anxiety, try to pinpoint the specific financial concerns that it stems from. Then, you can start checking them against reality. Lundquist mentions financially stable adults who are plagued by fears of destitution due to memories of earlier struggles, or a starvation sensibility passed down from earlier generations. 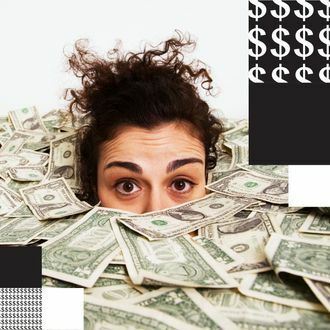 Money — and anxiety around it — is often integrated into our lives at an early age, before we can even articulate material needs and desires, Lundquist explains. Therefore, our feelings about it are not necessarily rational to our contemporary lives. These feelings can also be exacerbated when cultural messages about money are omnipresent, and invitations to spend, acquire, and compare are so unavoidable. Discerning rational anxieties from irrational ones requires some reality checks. (My fear of overspending, for instance, was rational. My belief that knowing the full extent of my overspending would somehow make it worse? Irrational.) Naturally, the reality checks that therapists like Lundquist and Tessler prescribe often involve talking — say, airing your fears to a trusted loved one or professional, and asking if they think the numbers that keep you up at night are bad enough to lose sleep over. Walking through the repercussions of your bugaboos can also help — if that which you fear takes place, what is plan B? Is there a plan C? What, realistically, are you at risk of losing? Are you going to lose your home, or just some pride? How would day-to-day life change in your best- and worst-case scenarios? The goal isn’t to eradicate money worries entirely. “Some amount of anxiety around money is healthy,” Lundquist opines. “Like, ‘Yikes, I think I overspent this month, and I overheard my boss talking about cutting back, that makes me nervous.’ Or, ‘My kid’s orthodontic issue is going to be a lot more complicated and we’ve just committed to this expensive vacation, I’m nervous.’” Then, the challenge is not banishing the anxiety but moderating it — which can require practical, measured action. That could mean looking for a new job, hiring a financial planner, consolidating debt, or asking a friend to sit next to you for moral support (or enforcement) while you finally open the bills you’ve been avoiding. Perhaps the most brutal truth about money anxiety is that money actually is worth worrying about. As Tessler notes, confronting rational stress can also mean “giving yourself a larger perspective that you’re going to have ebbs and flows in life and in money.” Tessler refers to these “ebb” moments as “money koans,” like a money riddle, or “something you haven’t figured out yet.” Some money riddles can be resolved in a matter of days (opening a new bank account; paying a Venmo debt). Others are matters of months, years, or decades (repaying loans; paying a mortgage; getting through an audit). The nature and duration of your koan will also influence the strategies you use to tackle koan stress. During my one-woman debt crisis, I finally resolved to review my finances on the regular — but only during daylight hours, to avoid spiraling and sleep loss. I’m not sure whether that qualifies as good advice, but I did eventually get things (somewhat) under control. Perhaps the most brutal truth about money anxiety is that money actually is worth worrying about. For all the psychological acrobatics and emotional coping mechanisms, the best solution to financial anxiety is and will always be improving the reality of your finances — which is, of course, significantly easier said than done. (And not even that easy to say, to be honest.) And thus, we arrive at the most frustrating koan of all: You can manage your financial anxiety, work through financial koans, discover how childhood trauma shaped your understanding of money and uncover all the ways your parents fucked you up, but you can’t opt out of money-related stress, because you can’t opt out of money. Unless, of course, you move to that ashram. Or take a few minutes to dream about it — and then login to your Chase account, look at the numbers, and finally do your damn taxes. Or whatever actions your koan demands. My Parents Think I Can’t Support Myself Financially. What If They’re Right?